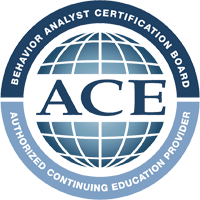 On-demand Continuing Education Units for BCBA®s covering a range of topics in behavior analysis, autism spectrum disorders, supervision and ethical practices. Behavior analysts have an ethical obligation to provide students/clients with the most effective int..
Professional and ethical behaviors are critical for high quality care and consumer protection. By us.. The science of teaching has provided many effective tools. However, even the best planned lesson ma..
Providing services to people with disabilities is a team sport. That means that as a BCBA®, b.. This interactive webinar will introduce participants to a family centered, positive behavior suppor..
As early as 1938, in his book Behavior of Organisms, B.F. Skinner envisioned a science of behavior a..
More and more youngsters are being diagnosed with autism under the age of 3, creating opportunities .. Many BCBA®/BCaBAs have a lot of experience supervising interventionists. Training, mentoring, and sup..
Government reports and popular media stories indicate widespread misuse of restraint/seclusion of st..
As behavior analysts, we are charged with helping others achieve behavior change. We are often calle..